Wray and nephew Over proof Rum is the world's top selling, award winning high strength white rum and accounts for 90 percent of all rum consumed in Jamaica where it is an intrinsic part of the culture, tradition and everyday living. Notes of banana and Demerara as well as spice and a little oak. Palate is fruity and a little spirity with long and spiced finish. 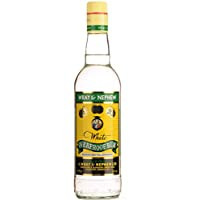 This is the original Jamaican rum of the Jamaican people. Still made here on the island famous for big personalities and flavours.